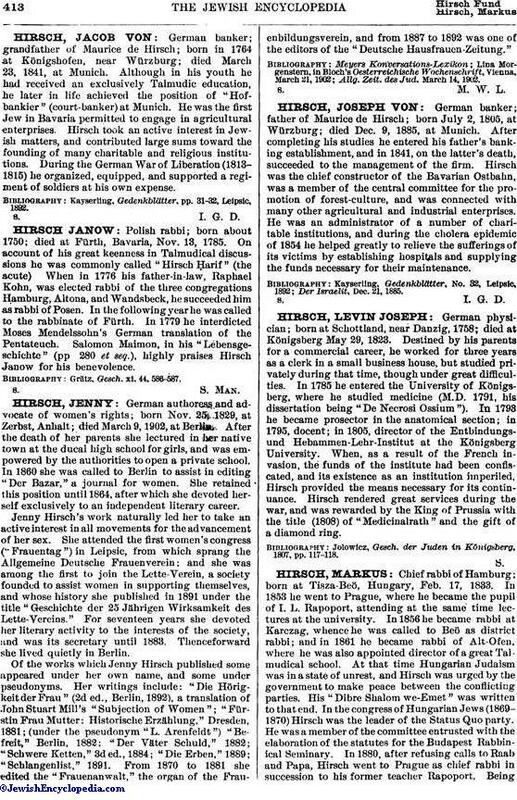 German banker; father of Maurice de Hirsch; born July 2, 1805, at Würzburg; died Dec. 9, 1885, at Munich. After completing his studies he entered his father's banking establishment, and in 1841, on the latter's death, succeeded to the management of the firm. Hirsch was the chief constructor of the Bavarian Ostbahn, was a member of the central committee for the promotion of forest-culture, and was connected with many other agricultural and industrial enterprises. He was an administrator of a number of charitable institutions, and during the cholera epidemic of 1854 he helped greatly to relieve the sufferings of its victims by establishing hospitals and supplying the funds necessary for their maintenance. Der Israelit, Dec. 21, 1885.